Michelle and I spent a week on the gorgeous island of Malta, a historically rich and cultural vibrant small EU country. The occasion was, as usual, double: an exhibition and a Curatorial School. A combination of openings, lectures and seminars kept us pretty busy. We are still waiting for visual material to come our way. Once this has arrived, I will post the usual information in the Exhibitions section of this website. 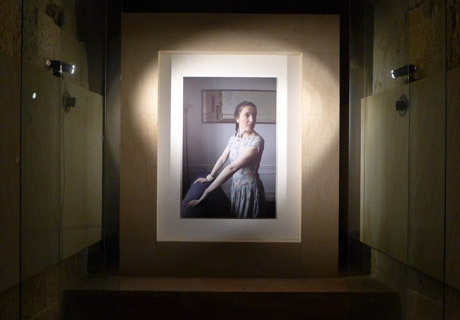 This Vermeer-like photo gives a preview of the quality of the curation, done by Raphael Vella. Raphael had initiated and organised the arts festival in which the exhibition took place as one of three works by non-Maltese artists. All three works are highly political, in very different ways. The film Madame B was also screened, in an outdoors theatre. This turned out not the best idea - when Emma began to die, towards the end of the film, fire works went off. A particularly successful screening was State of Suspension, a film that has sadly acquired renewed actuality because of the recent gruesome war. Then, last night, on the ominous date of 11 September, the World Première of Madame B finally took place. 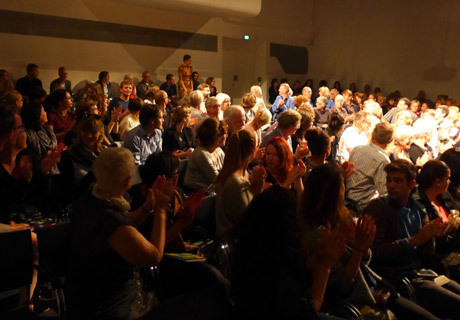 The event was hosted by the Stedelijk Museum Amsterdam, in an auditorium of 200 seats - all taken. Here you see a section of that large audience, applauding Marja Skaffari, as they will soon also do for Thomas Germaine and Mathieu Montanier. To our delight, all three main actors were present.